Christopher Platt, a former Episcopalian priest in Lexington, Kentucky, passed away at his home, shortly before Christmas. He was 63. A private, family memorial was scheduled in accordance with his wishes. Among the crowd were friends, family, former parishioners at St. David and St. Augustine’s; a police captain from his time as chaplain to UK police; alongside people he had baptized, and couples he had married. New friends he had made in recent years in a new community also came to share stories, one young man choking up as he explained that Chris was his first introduction to the concept of “neighbor.” Speakers shared their fondness for his ability to punctuate a story perfectly with the precisely timed long draw on a Marlboro. A born raconteur and storyteller, his flair for a bawdy joke was recalled on more than one occasion. Over his decades as a priest, and as the Reverend of what was then St. Augustine’s Episcopal Church at the University of Kentucky, he presided over the weddings, baptisms, and funerals of hundreds of parishioners. 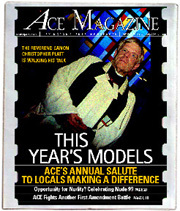 Until March 2003, he held two Sunday services and a Wednesday service at St. Augustine’s. He opened the doors of the chapel to students, to faculty, congregants, to the UK police department (where he served as chaplain), to AA meetings, and occasionally the homeless. He and St. Augustine’s provided the first basement kitchen space to Moveable Feast. 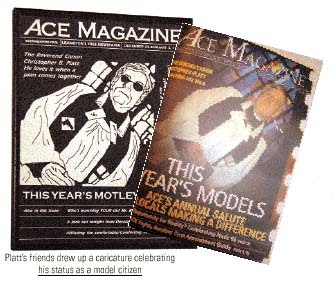 In 1998, he was on the cover of Ace as one of “This Year’s Models” for his hands-on charitable work. In his autobiography for the story, he said that he was a descendant of Henry Clay on his mother’s side, and “The Chief” on Get Smart on his father’s side, joking in the article, “good breeding is always risky.” He was as beloved for his self-deprecating and acerbic wit as he was for his compassion. Although he did not designate a memorial charity, at the time of his passing, he was supporting the Policemen’s Memorial Fund; Shepherd’s Green Sanctuary in Cookville, Tennessee; and Heifer International an organization whose mission is to end hunger and poverty. “Forever Young” and “I’ll Fly Away” were played by friends at the Service. Below are a few more songs dedicated to Chris’s memory. Feel free to assemble an iTunes playlist in his honor and toast to the blessing he represented in all our lives. So let’s don’t take to long. And nothin’ is to much to bear.